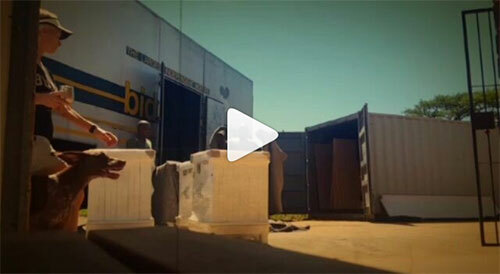 "My kitchen units were delivered to me on Friday afternoon. They are so beautiful. Everything arrived in perfect condition and I inspected every unit very carefully." When you go to the doctor and return with a kitchen! 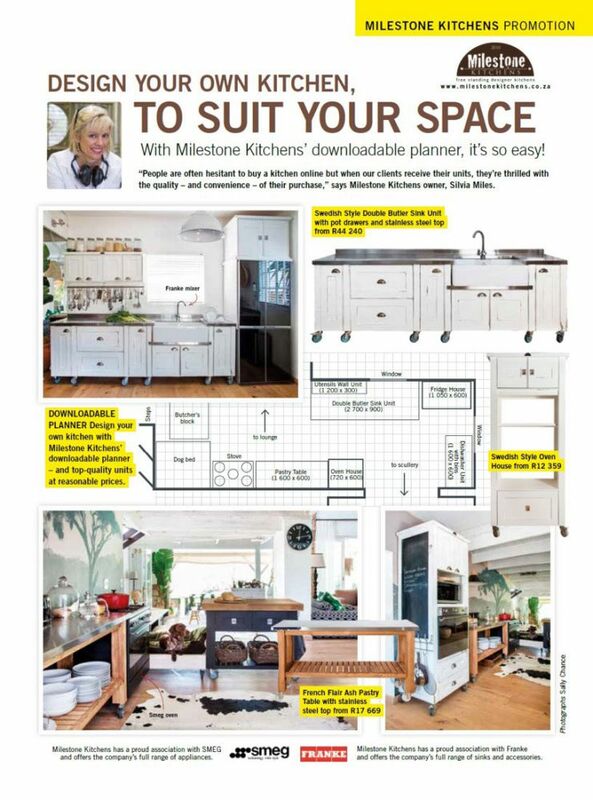 Sam spotted Milestone Kitchens in Garden & Home magazine, while waiting for a doctor's appointment. 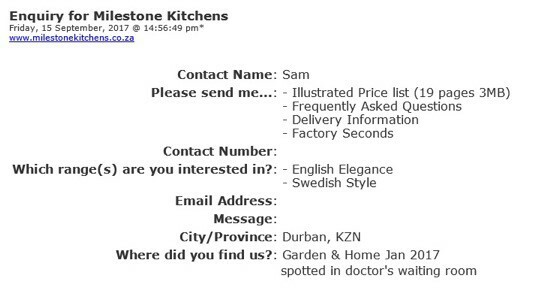 Thanks for getting in touch, we look forward to creating your dream kitchen. Another beautiful kitchen, designed by a client and converted into reality by Milestone Kitchens. 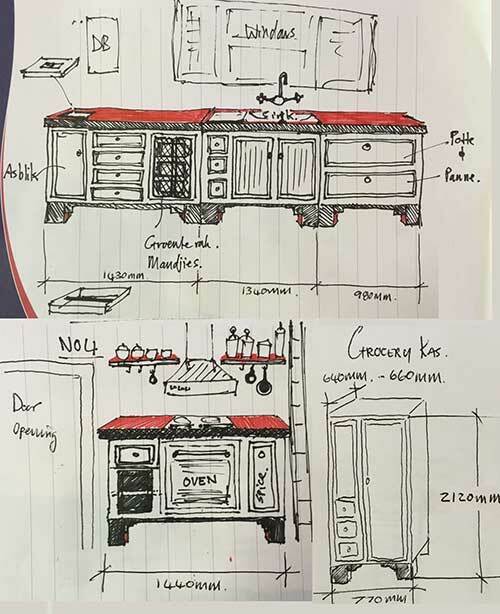 Carol designed her dream kitchen using our Kitchen Planner and it has been such a joy to bring this kitchen to life! 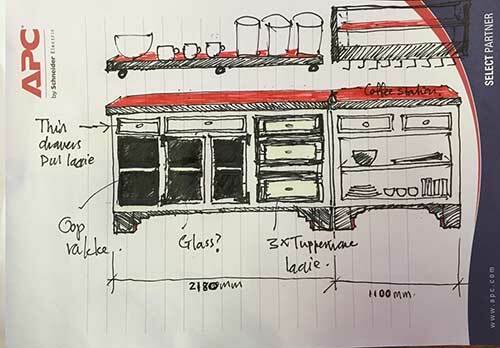 Carol has chosen a customised Coffee Dresser with space for a microwave, two Butler Sink Units, a spacious Drawer unit, Utensil Wall Unit, Broom Cupboard and customised Deluxe Island. 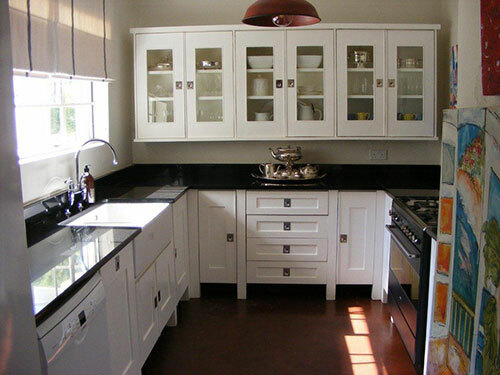 Her units have been designed in Swedish Style, with lovely silver cup handles. 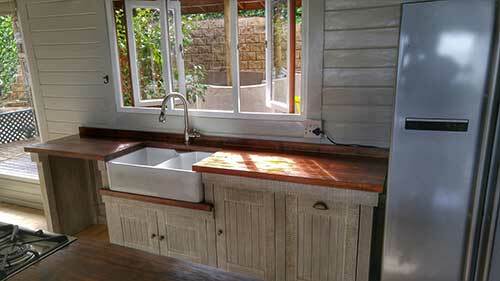 She chose mahogany-coloured solid pine tops, which contrasts the white units beautifully. Here is an image of Carol's kitchen layout, as well as pics of her Deluxe Island. Chic contrasts and monochrome tones...we are loving how this kitchen is looking! 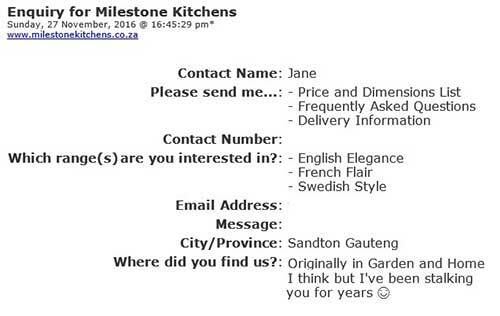 Our client Eleanor, from Hillcrest in KZN, ordered her units in the Swedish Style range without tops, and had granite fitted on site. Eleanor requested fitted units, which is always a possibility when ordering from us (it just requires a little more work from the client). This photo shows the Cutlery Server and Sink Unit joined with a dead-end panel, and on the wall is a Microwave Unit with cupboards. Eleanor is not yet finished with her kitchen and promises to send more pics. We can't wait to see! This new corner unit, in African Allure style, was created for a client in Pietermaritzburg and compactly fits in drawers, a bin, space for trays, with room for a dishwasher too! 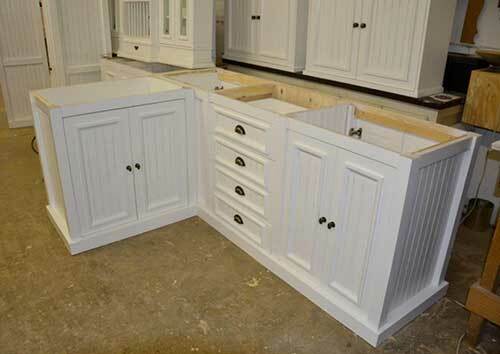 The sink will fit neatly above the double doors, and we've incorporated space for bar stools on the edge of the unit. We just love it! Fresh apple green and full of fun! 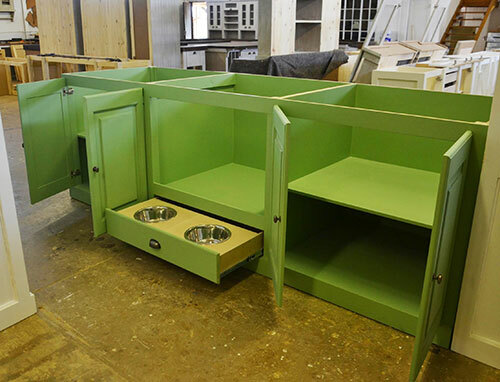 We're loving this custom-made island a client asked us to create, which includes space for her precious pooches. This design inspired our Nina Island. 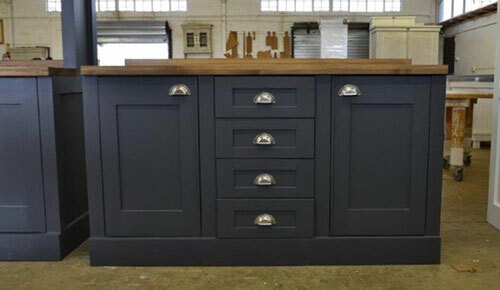 Did you know that all of our pieces can be customised to suit your needs? Contact Us to find out more. KZN-based friends, we hope you picked up a copy of the @SundayTribune over the weekend? Tears of joy are a welcome side effect of discovering the Milestone Website. 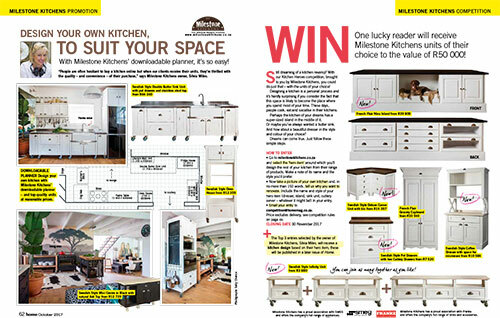 Enter this competition via Home / Tuis magazine. See competition for details. 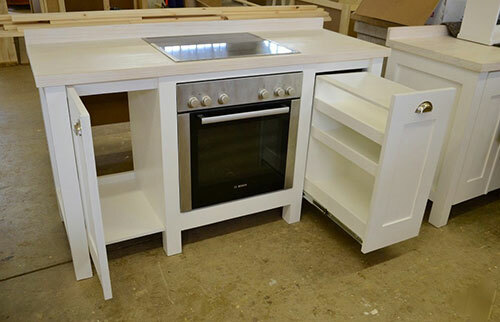 These are a few pictures of a Milestone Swedish Style Kitchen we sent to Zambia. 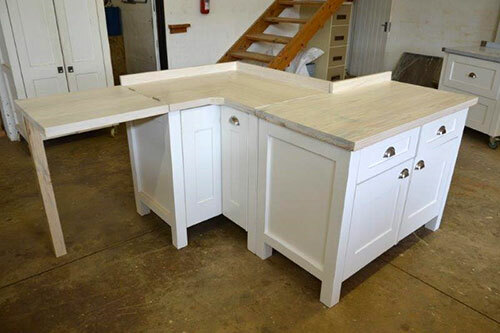 Our client, Rita opted to have her units ordered without tops. She had the granite tops put on when the kitchen was in. I am proud what we can achieve with clients across the miles. "Our kitchen is a tiny galley kitchen. As we live on a farm, I went for units on legs for ease of cleaning and also as our cement floors are not level - chose Swedish Style with white painted units and black granite counter tops. 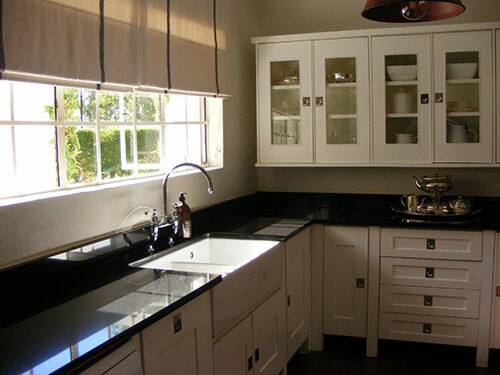 We just love our kitchen and it more than met our expectations with quality fittings and workmanship. 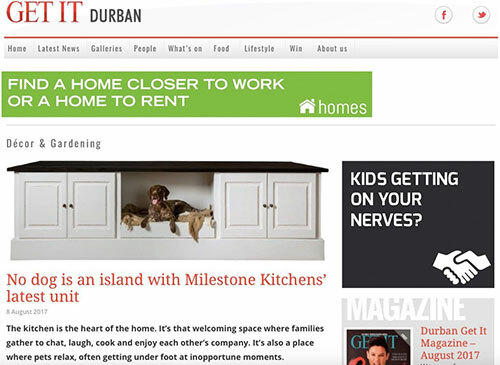 I have no hesitation in recommending Milestone Kitchens. 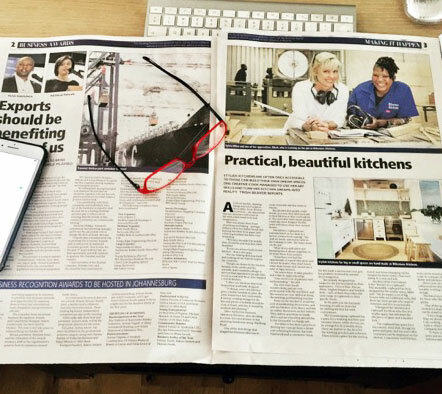 Sylvia is very talented with design and layout and Lulu is beyond helpful, we received outstanding service and the kitchen was delivered in perfect condition and on time. Unfortunately photography is not my forte but hope attached pics will give you some idea. Thank you Dea for taking the trouble to notice and to write to us about it. We try. building isn't cheap these days. All in a day’s work at the Milestone Factory office. 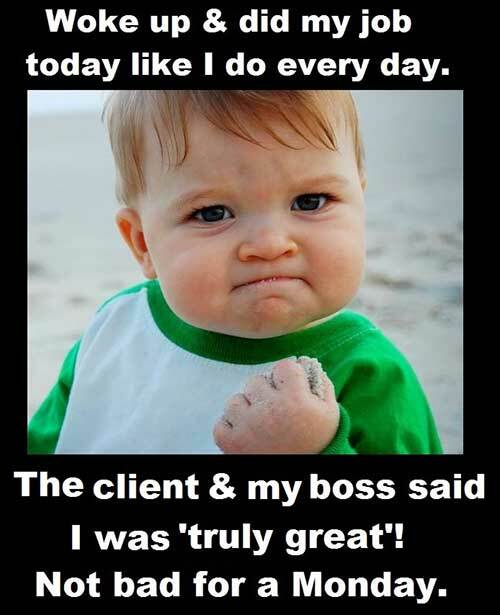 This is a transcript of an actual conversation that we had with a client. It is the kind of conversation we have all the time so I thought I would share it with you because you probably have similar questions. Thank you for your kind words. Have you seen our Factory Seconds? no I haven't. where can I check that out? 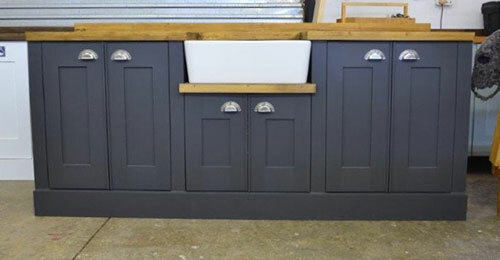 Are you in the process of renovating or refurnishing your kitchen? 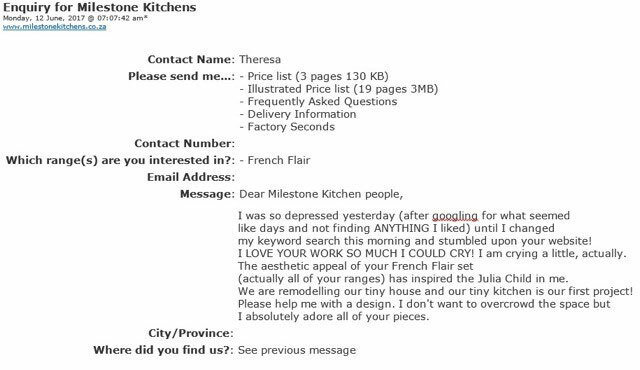 Have I sent you a pricelist? I have sent you the pricelist as well. Have a look at the unit prices. If you would like a quotation, please feel free to send us your floor plan and requirements and I will send you one as a matter of interest. The great thing about Milestone Kitchens is you can order a piece at time and add on as your budget allows. You can also order units to spec. Delivery to any one of Biddulphs major depots will be free of charge. 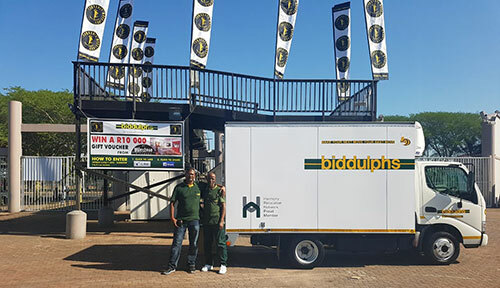 Biddulphs depots are Pretoria, Johannesburg, Potchefstroom, Bloemfontein, Cape Town, George, Port Elizabeth, Durban, Pietermaritzburg, Richards Bay. You would need then only arrange collection from their depot to your physical address. great stuff. What kind of wood do you use? 80% of our units are made out of solid pine. We use Supawood in structural places where warping could be a problem, such as the door frames. We also used Supawood for the shelves and the inside of the drawers. 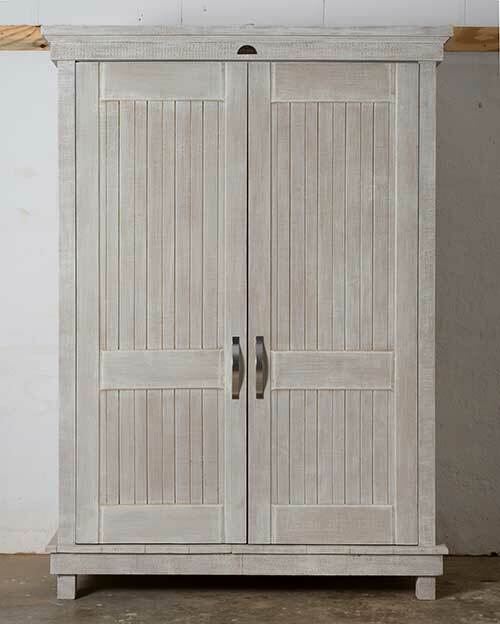 In the case of the French Flair range the entire door is made of Supawood. 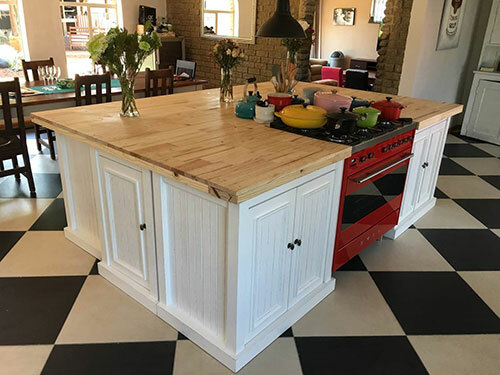 The backs of the units are made of Masonite except where they are visible in which case they are made of either Pine (African Allure and English Elegance) or Supawood (French Flair). 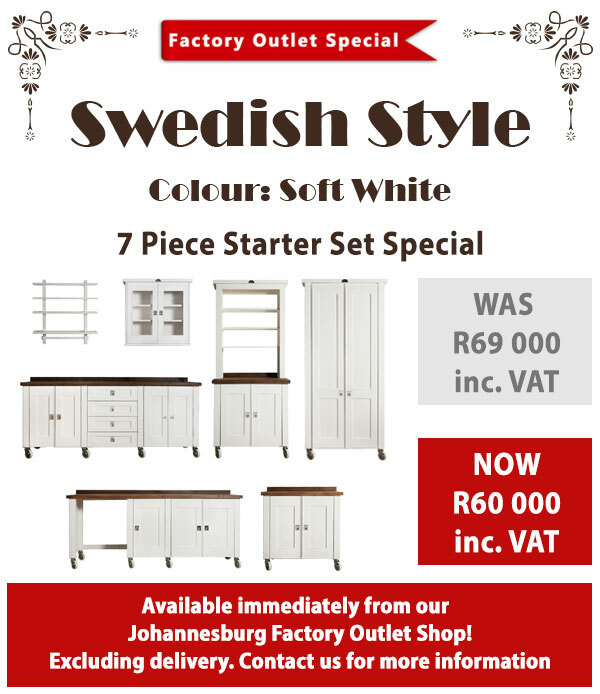 The Swedish Style is made up of a combination of pine and Supawood on the doors and Supawood for the shelves and inside of the drawers. WE NEVER USE CHIPBOARD. and units come complete with handles, backboards etc? Fully assembled with backboards and handles. The only place we could leave a back off, but only by clients request, is in the sink units to accommodate the plumbing. Anything you need, some back up on or want to know whether we can or can't do, give us a call, give us an email or Whatsapp. We will assist you. Im trying to email our chat to myself but am struggling, can you help? Yes sure. Can I send it to the email above? I am going to attach our FAQs to the email so you can peruse them with hubby. Anything we don't answer in there that you want to know, give us a shout." 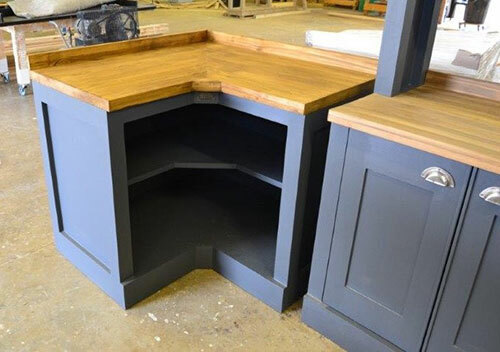 Cleverly designed Corner Unit for a small kitchen with space on the left for a washing machine. 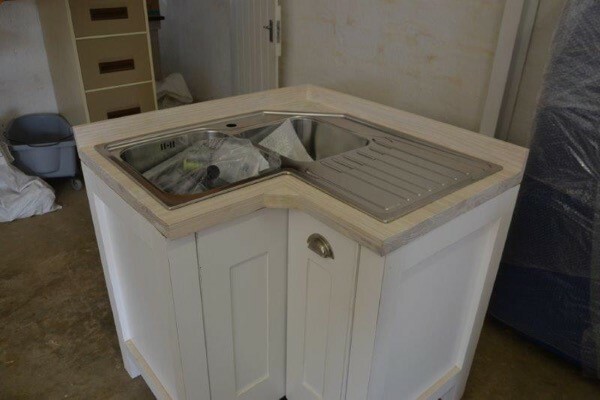 The corner sink fits into the Corner Unit. Swedish Style. On legs. Ice White. 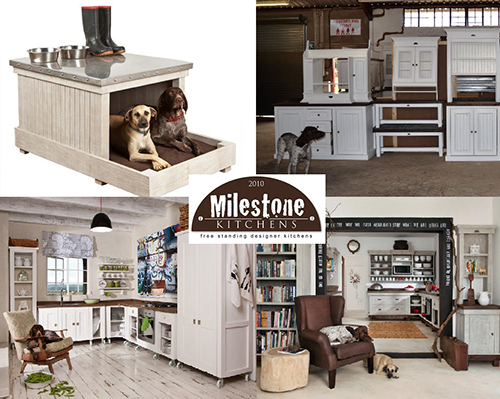 Adding to our (already spectacular) range of free standing units, Milestone Kitchens has been working on a new, more specialised kitchen cupboard. The House Keeping Cupboard. The House Keeping Cupboard can be customised to fit your accessories and is the perfect way to hide all cleaning appliances, laundry items and clutter to keep the kitchen looking modern and tidy. Contact Us for more information on how to order one. Our KIAC in Dulux Night Jewel 3 with a Blonde top looks rather stunning. This one is going to Pretoria. Kitchen is finally finished in the nick of time. Sending a couple of photos. A few minor hiccups. But dealt with them. Finished the little bar area, Sink area, Corner tea section, Hob and stove section. Am really pleased with the out come. Thanks for getting my kitchen finished in time. 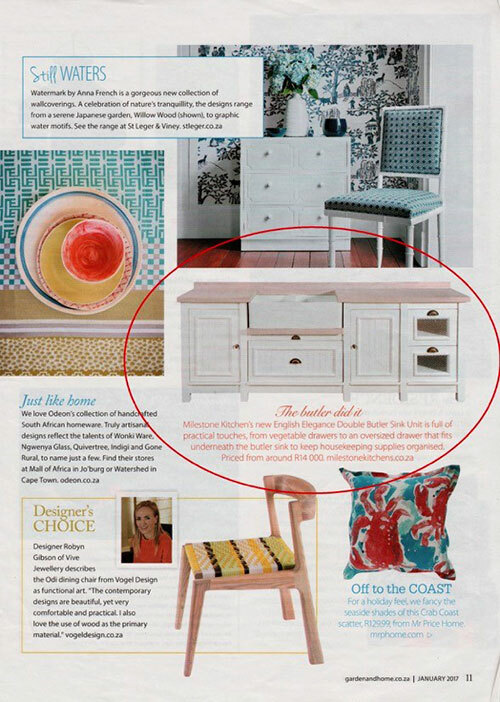 The English Elegance Double Butler Sink Unit with Utility Drawer, 2 doors and 2 Veggie Drawers featured in the January issue of SA Garden & Home. 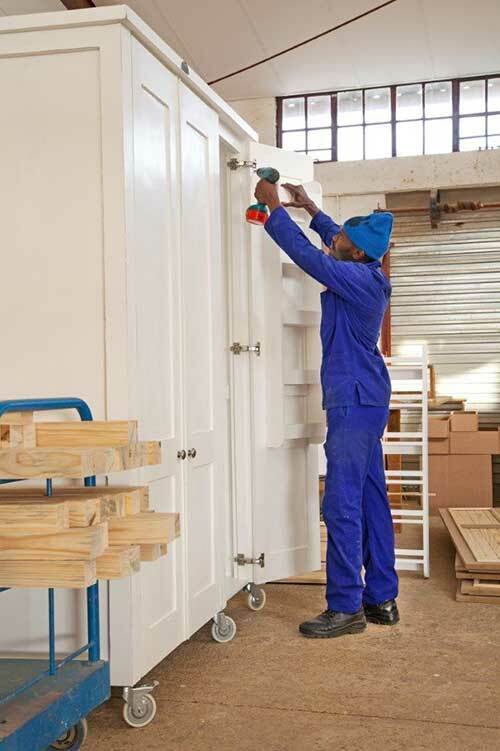 One of our carpenters, Mduduzi, working on a set of Swedish Style wardrobes destined for Johannesburg. Should you need a sketch with dimensions of the units you ordered so that the builder can ensure the plumbing in the wall is at the right place and height - just ask my trusty PA. She will supply as below. Thank you Lulu for always doing such stunning digital sketches for our clients. I love this small and simple free-standing kitchen that is part of a very welcoming living area. I would love to cook in this space on a cold winter's night. 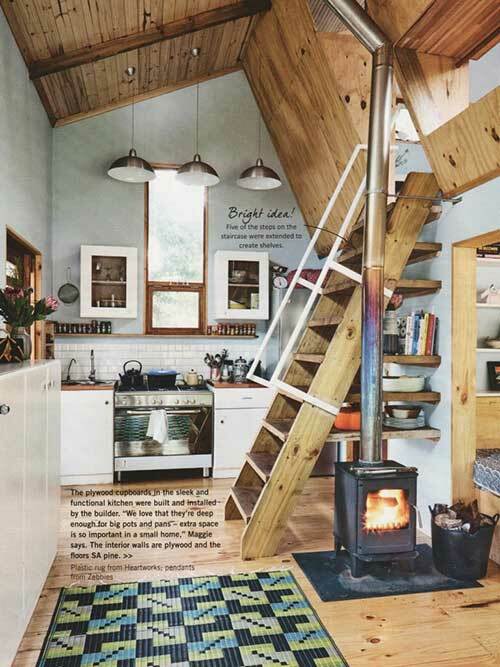 I particularly like the way the steps have been extended into book shelves. 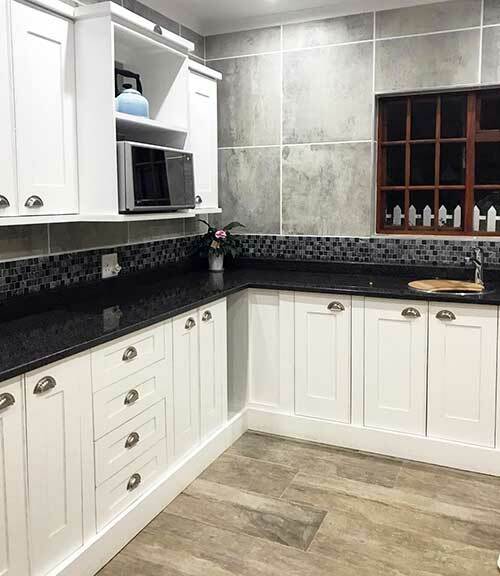 If you are redecorating a small holiday cottage you could achieve a similar and probably even better look with Milestone Kitchen units. 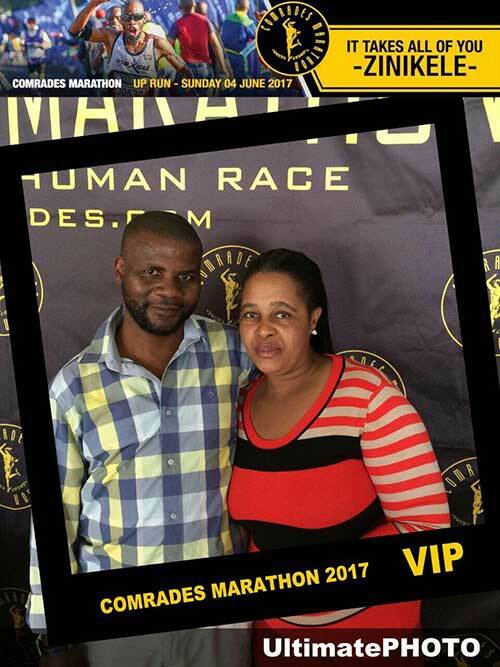 Our factory manager, Dennis & his wife Wendy had a blast at the Comrades Marathon this past Sunday. Set up at the Biddulphs stand for the Comrades Marathon has begun. Looking good. Well done Deshen and team. Cleverly designed Swedish Style Corner Unit in ice white for a small kitchen with space on the left for a washing machine. The Corner Unit accommodates a Franke corner sink perfectly. Adding to our (already spectacular) range of free standing units Milestone Kitchens has been working on a new, more specialised kitchen cupboard. It is called the House Keeping Cupboard (1400mm wide, 650mm deep and 2100mm high). 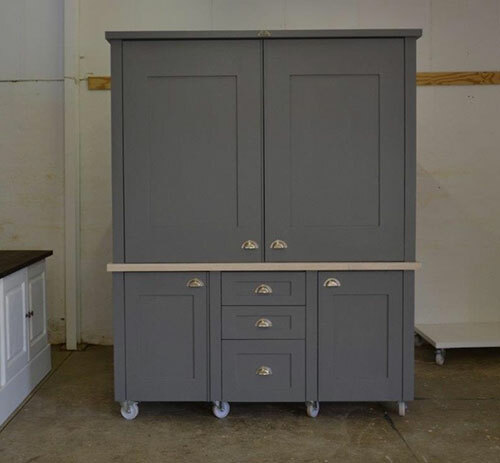 We have designed a cupboard that is perfect for homes without a laundry room by reinventing the broom cupboard and giving it a whole new make-over. The Housekeeping Cupboard is the perfect way to hide all cleaning appliances, laundry items and clutter to keep the kitchen looking modern and tidy. On the outside this cupboard looks like an ordinary grocery cupboard but inside the House Keeping Cupboard there is room for a washing machine, vacuum cleaner, broom, ironing board, buckets and a variety of cleaning products. All in one convenient place and neatly tucked away out of sight. There are a variety of shelves for packing away ironed laundry and also a hanging rail for any items that need to be hung instead of folded. 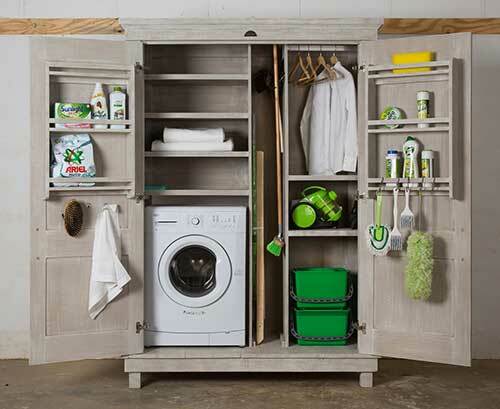 Shelves inside the door offer handy space to store essentials like scrubbing brushes, washing powder or detergents. 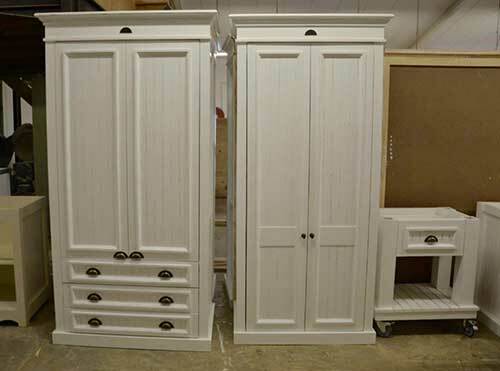 The House Keeping Cupboard can be customised to fit the clients accessories. The back of the cupboard behind the washing machine is open to allow the outlets for the washing machine pipes and electrical wires. 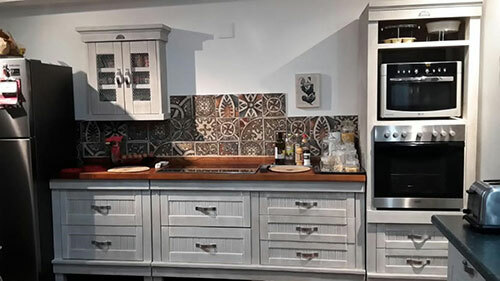 The cupboard photographed is in the African Allure range but it is available in any of our 4 ranges and finishes - the English Elegance, the French Flair and the Swedish Style - and you may have this unit in any colour your heart desires. 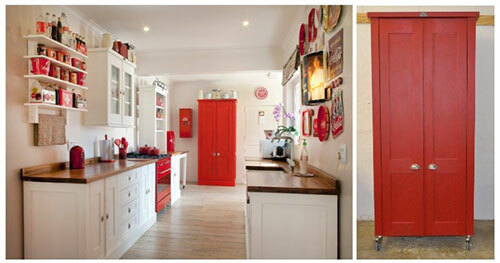 You can order this beautiful cupboard directly from us, there is no middleman, go to milestonekitchens.co.za. Starting from R16 500 excluding appliances. 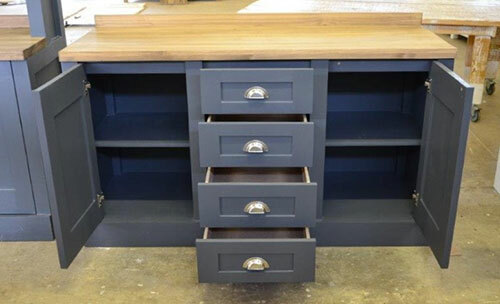 We are happy to oblige with custom made units or adjusted measurements so that it can fit into your special place. 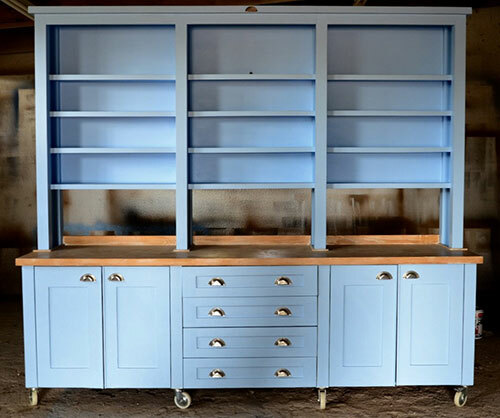 We love this Swedish Style Deluxe Coffee Dresser in Plascon Scandinavian Sky 8445-1. 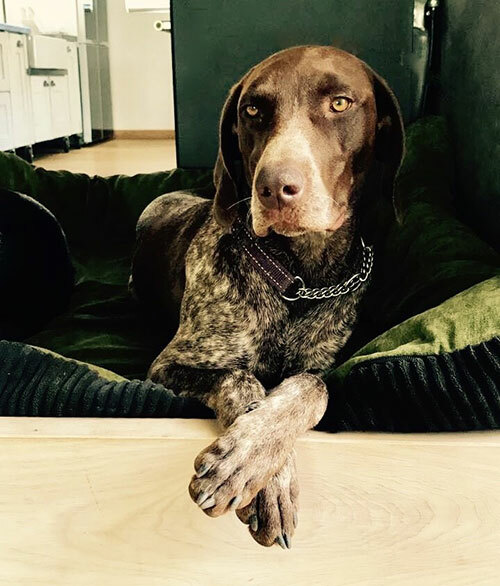 This stunner made it’s way down to Knysna recently. Well done Richard on the great choice in colour. 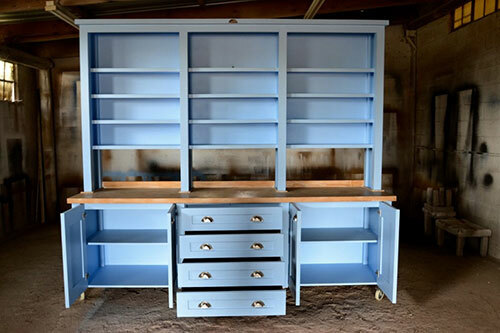 Well done to Valné in Namibia for choosing such a stunning colour for her Swedish Style Milestone Units. Dulux Night Jewels 2 - 00NN - 13/00. We simply love this. It's classically stylish and elegant. The colours, the design, the quality of the workmanship is simply superb. The Island and Stool is pretty cool too! This is the only acceptable form of stalking…and we dig it! 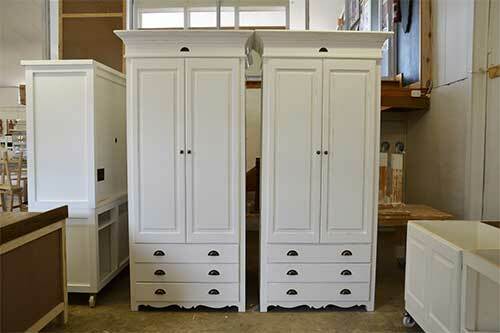 Two beautiful French Flair wardrobes ready to leave the factory. 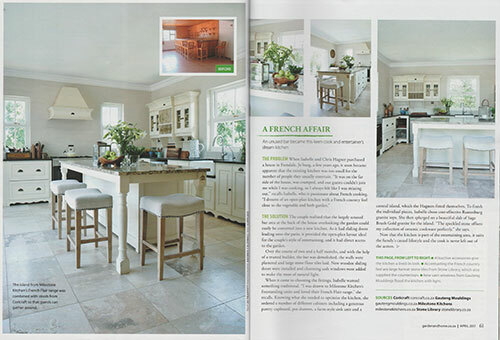 Our latest promotion in the HOME/TUIS magazine features parts of my own kitchen. I decided to add a bit of jooj to my existing Milestone Double Butcher Block by painting it graphite back. What do you think of the result? Also note beautiful Nina lying ever so eloquently on the dog bed. It is like she has always belonged here. 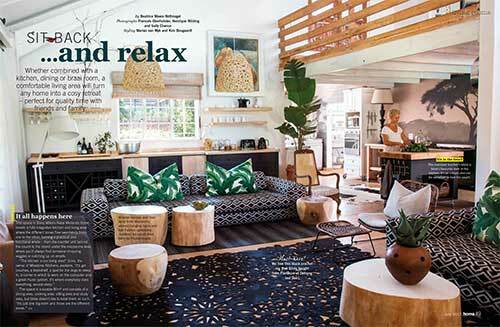 See our African Allure promo on page 108 of the April issue of House & Leisure. Welcome Nina, the newest addition to the Milestone Kitchen factory family. 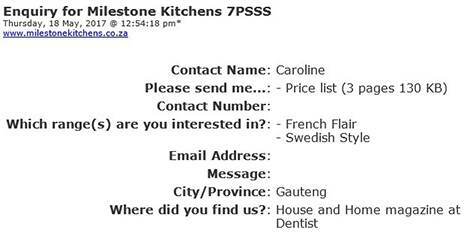 If you know Milestone Kitchens, you know we love GSPs and better than that, we love rescuing GSPs. I must just tell you, since we bought our property in Mozambique 7 years ago, I said to my husband that when the house is almost ready I want a Milestone kitchen. I always had my eye on your kitchens. Absolutely love it, can’t wait for mine! Red never seems to date. Used with white and natural wood it is bright, cheerful and young. Perfect for a couple with a young family. Don't miss Isabelle Hagner's beautiful Milestone Kitchen in French Flair in the April Issue of SA Garden & Home. 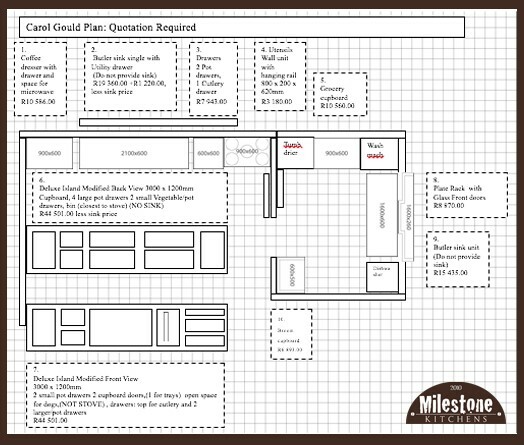 How did you find/why did you choose Milestone Kitchens? 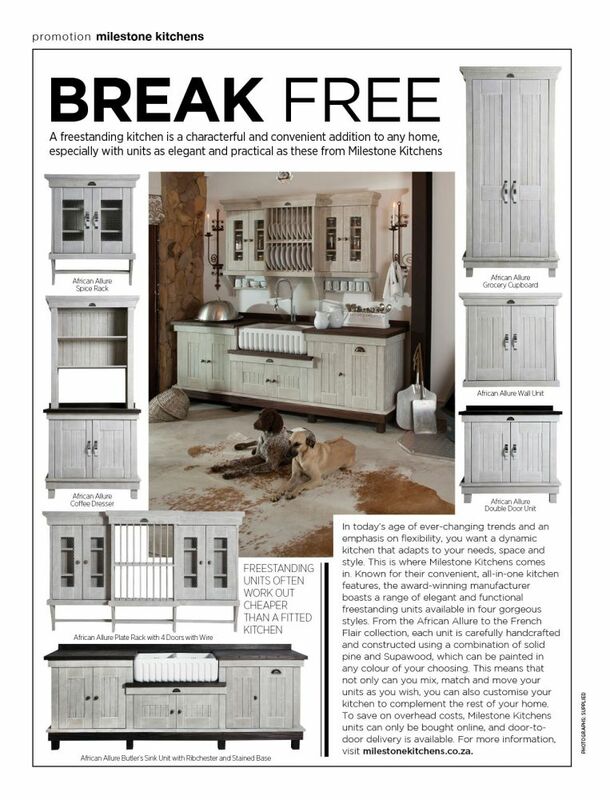 I specifically searched for French style/solid wood kitchens via the internet and on magazines. 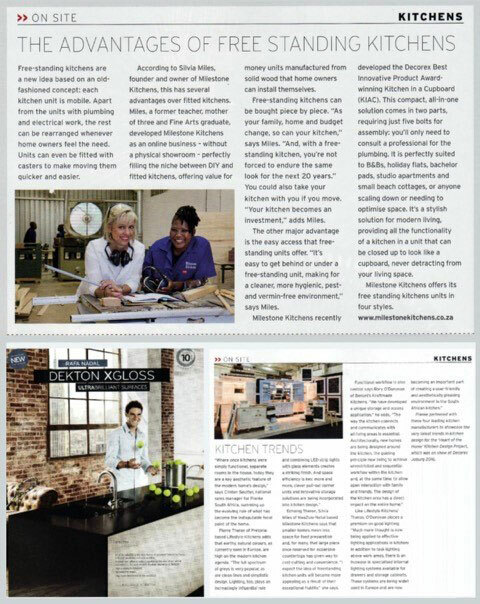 I actually saw the first striking picture of what type of kitchen units I wanted to have in a Garden and Home Mag in an advert for Milestone Kitchens and, after further research to compare and settle on the right product for us, chose Milestone kitchen as they offered by far the best quality/price. Did you work with them on the design of your kitchen? 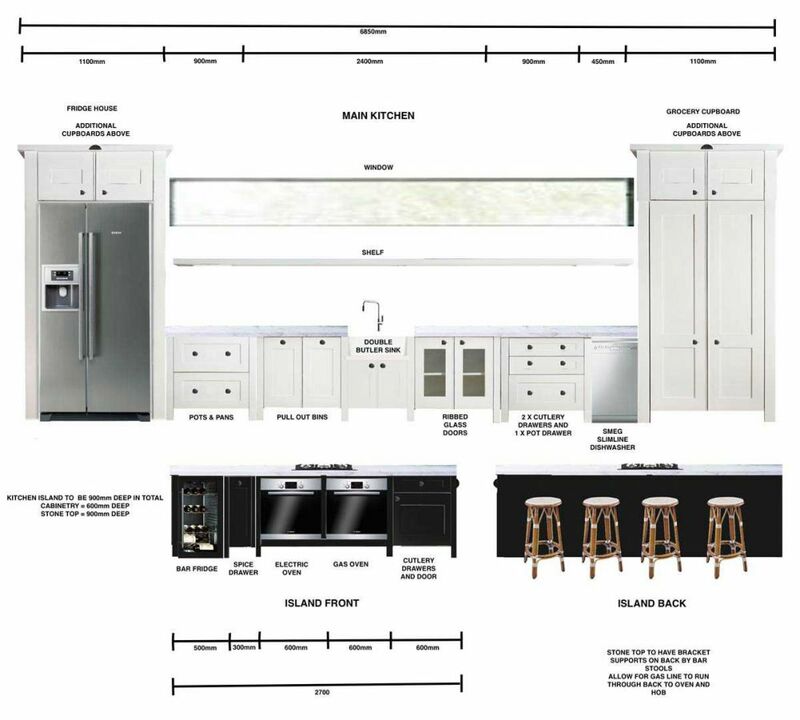 Not really, I took my measurements and drew the plans inclusive of passages and windows and existing appliances, and then browsed the very complete units specs to first chose the basic units I absolutely wanted to see in my kitchen (a big pantry, corner units and 90 cm pot drawers, sink unit, server as a base for my central console/island). I placed these on my drawing and then looked at the space left and what units would be fitting and useful to incorporate. I went to quite a few suppliers and found the best selection and service from The Stone Library in North Riding as they managed to not only give me the best price but complete the full job in 10 working days from my first visit to meet my birthday deadline date in December! Did you enlist the help of a builder or architect? If so, who? Did you run into any difficulties? Not really but I am a very hands-on owner and Project manager! But on installation we realized that we would need another corner unit which Milestone Kitchen managed to make available to us within a couple of weeks and my husband made a full day trip to collect directly from them to meet my deadline to finish the project prior to my birthday! We started with the building work late September and finished the full installation on December 10th. What did you want to achieve from the renovation? i.e. do you entertain a lot? We DO entertain a lot J and this project has definitely changed our way of doing it. Also this open and welcoming space has now become the place where everybody want to be, from my daughter helping with harvesting some veggies in the garden and the cooking with me in the evening or doing arts and crafts, to my husband and I when we have extra work to do in the evening on our laptops! Did you have a strict budget? No but it was so inspiring and exciting that I am actually considering doing this as a full time job one day in future to help people achieve their dreams without breaking the bank… I just LOVED IT! An African Allure kitchen being loaded up, ready for the long hall to Knysna. Biddulphs makes it look so easy. Stunning Island. 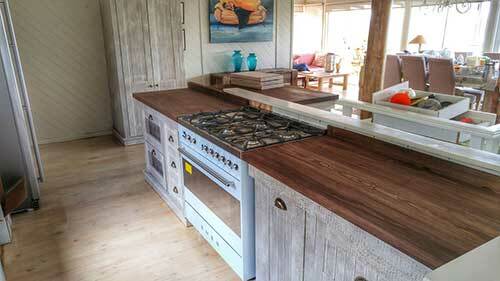 Designed by Quentin Campbell from Roodepoort made by Milestone Kitchens. 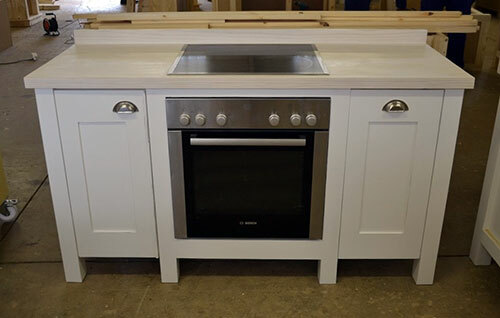 We really love the clean, simple lines and colours of this Swedish Style Stove Unit with fitted hob and under counter oven. This Stove Unit also features our Spice/Oil Drawer combo which can be included in any unit and accessed from the left or right. I am so happy and proud of my Kitchen Units. They are beyond gorgeous. My hubby Stephen, is so impressed with the quality of you workmanship. I will definitely in the future order from you again! Thank you very much Lulu and Silvia you service is excellent and rare! We put our back into our work for clients like this. And we love it when husbands give their stamp of approval. Thank you Monica, we loved working with you too. This is one of Monica's beautiful units. 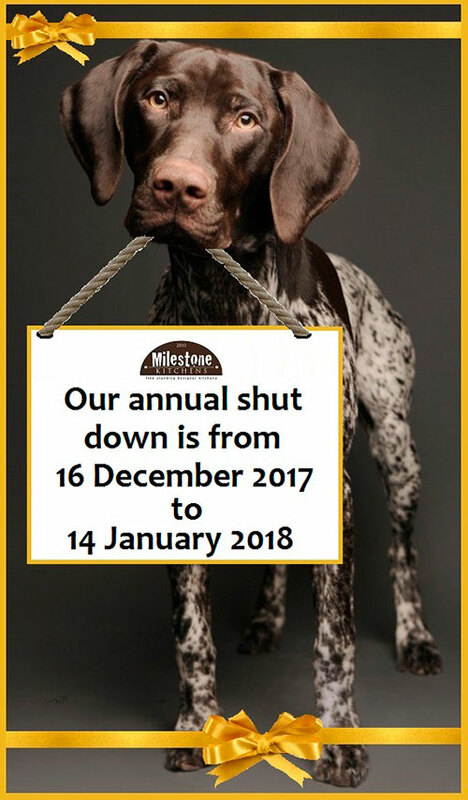 All Milestone Kitchens are German Shorthaired Pointer approved and we have the proof. 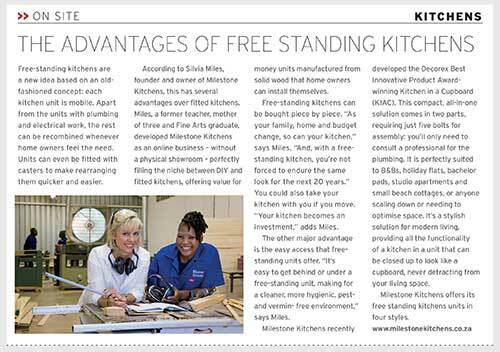 This is good to read if you are considering buying a free standing kitchen. Here I am pictured with Goodness, our head painter. She is brilliant at her job. "Thanks for all the effort from your side Lulu – you truly are great! 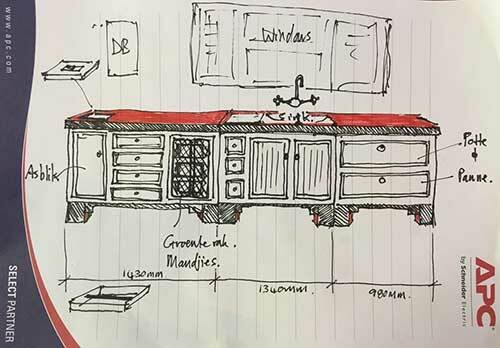 More beautiful sketches from clients. We can custom make anything. Send us your sketches. 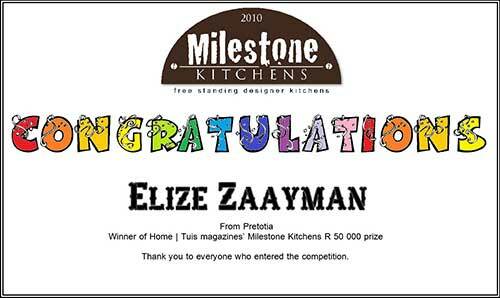 Congratulations Elize Zaayman. We look forward to working with you. No, your eyes are not deceiving you. 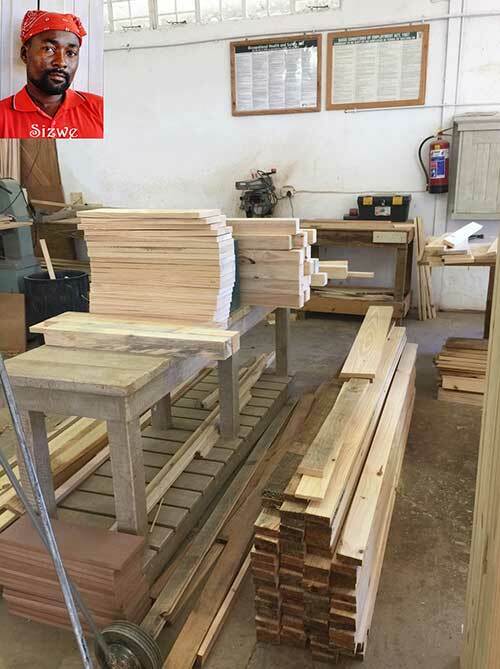 This is really how our wonderful carpenter, Sizwe, keeps his workstation. How awesome? 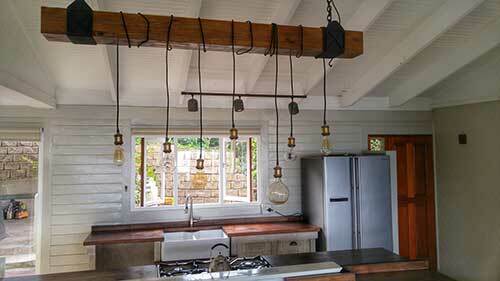 Stunning job, Richard from Knysna. African Allure with highlights of Sky Blue. Beautiful in his beach home. Relaxing. Peaceful. Inviting. Very handy Richard is with good taste and clever with his use of colour. We LOVE it. 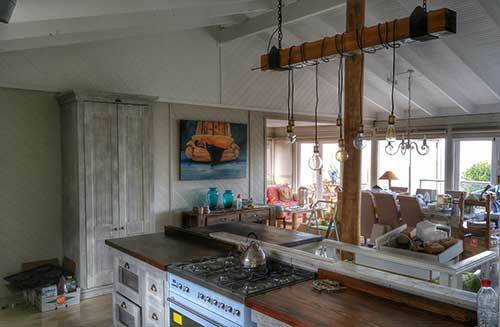 We really love this kitchen design sent in by a client. Check it out for some great ideas on planing your kitchen. "I would like to congratulate you on your absolutely brilliant service!" 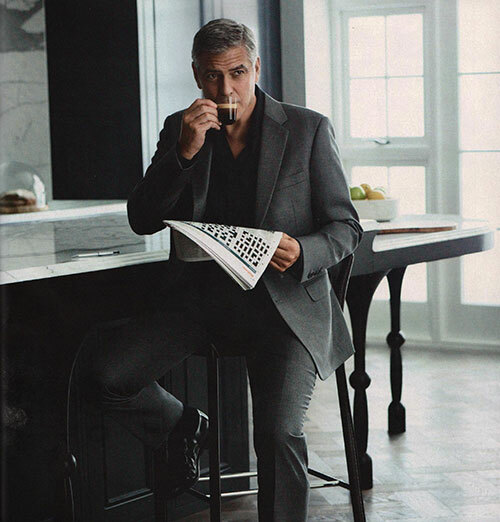 "Silvia, my kitchen looks GORGEOUS! Thank you also for your EXCELLENT service!!"